When I first read this book’s description I thought, “Damn, I could have written that book”. After reading it I think, “Damn, I wish I could have written that book”. Stacy Horn sings in a choir. I sing in a choir. She worries that no one she knows will sit next to her. Me, too. She sings Soprano 1. I sing Soprano 1. But this is a book about more than an individual's experience. 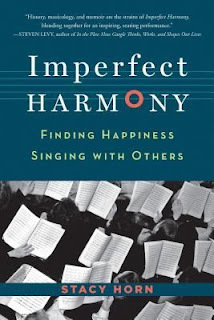 This is a book about singing in a choir. This is a book is about the history of choral singing, choral pieces and their composers. This is a book about the nature of music and about singing’s effect on the body. The chapter headings are pieces her choir has performed. We sing many of these pieces, too. She captures the beauty and the problems of being a member of a choir. Her description of the mean girls who tried to make her and a friend move was too funny. She loves singing Soprano 1 until she is demoted to Soprano 2. At one time, I too, would have been crushed thinking it meant I couldn’t hit the high notes. (I still expect to be asked to leave because they've discovered I can’t really sing.) But it's actually because there are never enough Soprano 2s. All Sopranos want to be 1s; the melody is the prettiest and it's easier. After reading her experience of feeling the harmony in a whole new way as a Soprano 2, I tried the Soprano 2 part and she’s right. It is completely different. She covers the history of choral singing, composers and their works. In New York's Grace Church where she sings, all through the 19th C only paid professionals could sing in the choir and the congregation wasn’t allowed to sing at all. Women were not welcome in the choirs until WWII, when as in the rest of society, they were needed to fill places men traditionally held. “What makes singing special is that it’s the one skill I’ve tried that make my life better and it works even though I’m not particularly great at it." Yes! Stacy, I know. Singing is the only thing I've tried where I didn't care how bad I was, I just wanted to sing. And I've gotten better over the years. When I first started in a community choir I never thought I would one day be singing Bach, Haydn, Handel. Singing changes the brain; it reduces stress and helps with some physical aliments. If you sing in a choir read this book. You'll recognize yourself and learn some more things about music. If you don't sing in a choir, why the heck not? Read this; it will show you why you should consider it. I'm glad you found it. I love your book! We are singing Messiah this Fall and I am going to sing Soprano 2 thanks to your writing.